Lovely Ivy from Greece’s Kopiaste is hosting this month’s Think Spice event, with the theme mastic. In 2008, I set a food challenge to use mastic but I never managed to do it so it rolled over into my 2009 challenges. With that weighing heavily on my mind, Ivy announced her theme ingredient and I just knew it was time to cook with mastic. Having eaten a mastic pannacotta in the past, I knew it worked well with cream so I decided to use Tessa Kiros’ mastic ice cream as inspiration. 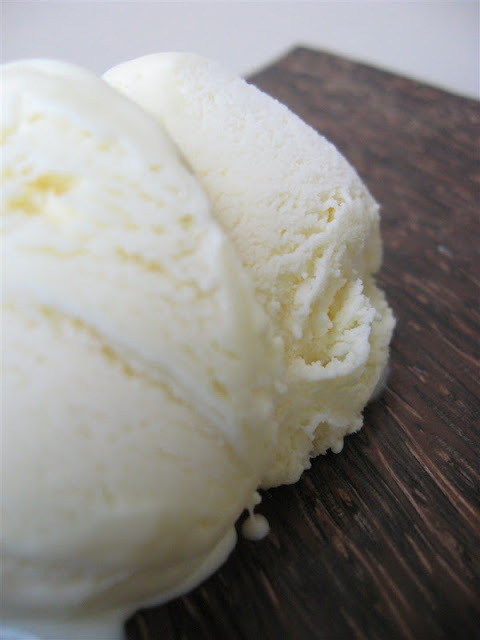 In Falling Cloudberries, Tessa doesn’t use egg yolks, nor whip the cream, but I find this makes for a softer, fluffier ice cream and so I created my own version entirely. The results had very mixed reviews. 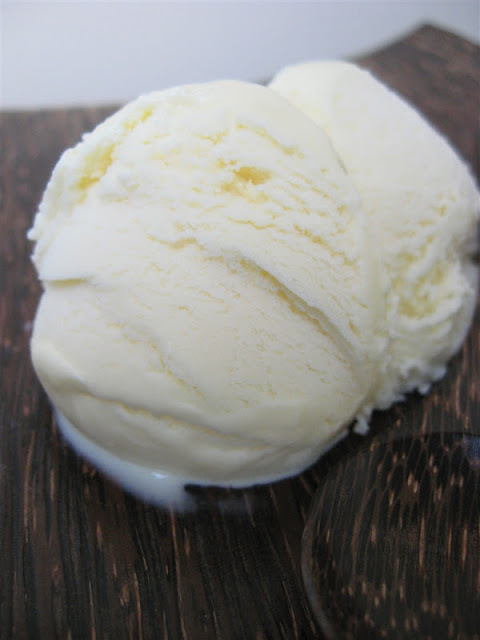 I adored the vibrant, pine flavours and found the sweet ice cream strange and yet moreish. And yet both Jonas and our friend, Bicky, took one bite and couldn’t continue. Bicky had been walking toward the table with her bowl when she snuck a taste. She froze in her tracks and her face look alarmed. Then she kept smiling and politely repeating that it was a “special” flavour, too “special” for her. Jonas on the other hand took a little lick, wrinkled his nose and pushed the bowl away from him declaring “there’s no way I’m eating that”. Ahh, what are husbands for? Instead of being offended, I found the whole situation slightly amusing, because for once I knew it wasn’t my cooking skills but the mastic itself that they were reacting to. The mastic did produce an almost chemical pine flavour, but since I enjoyed it I was secretly pleased that I had the whole litre of ice cream all to myself. 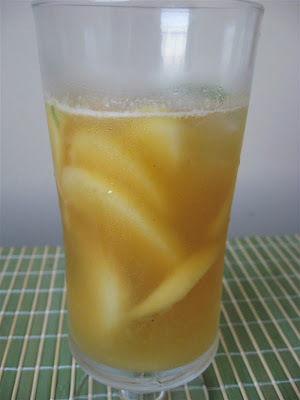 Mastic is certainly an acquired taste but, for those who love it, it is heavenly. 1. In a spice grinder, pulverise the sugar and mastic into a fine powder. 2. Combine the milk and sugar mixture in a saucepan and cook over a medium-low heat until sugar has dissolved and milk is almost boiling. 3. Put the beaten egg yolks in a bowl, then add the hot milk in a thin stream, whisking the entire time to avoid scrambling the eggs. 4. When completely combined, return the mixture to the saucepan and cook gently over a low heat until mixture thickens slightly. Set custard aside. 5. In another bowl, beat cream with electric beaters until soft peaks form. 6. Combine custard and whipped cream, beating with electric beaters to smooth mixture. 7. Cool before churning in an ice cream machine, as per the manufacturer’s instructions. Note: the flavour is very special, so if you’re nervous about it being too strong you might consider using ¼ teaspoon mastic granules instead. Mastic & Orange Flower (½ teaspoon orange flower water to milk mixture). Mastic is resin from the Pistacia lentiscus, a shrub found all over the Mediterranean and the Middle East. For some mysterious reason, only the trees in the south of the tiny Greek island of Chios can produce this special flavoured resin. The shrubs can reach over 100 years and 3 metres high. The sap leaks from wounds in the bark of the shrubs and is then sun-dried into tear-like granules. 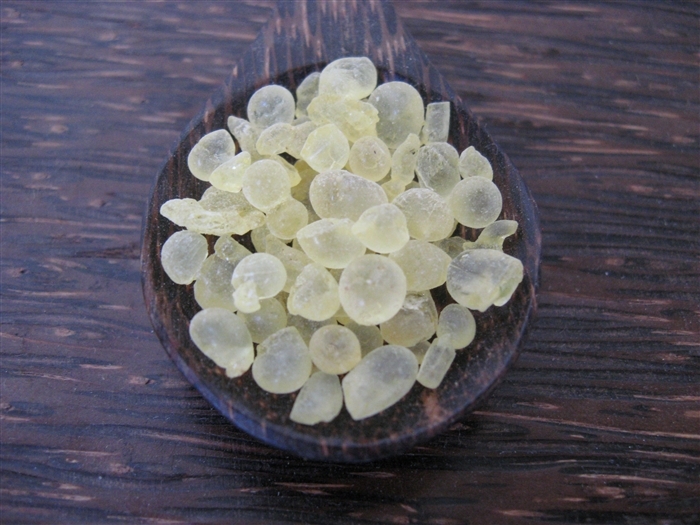 Mastic is used in drinks, as a gum and for flavouring spirits, liquors, sauces, cheese, cakes and desserts. 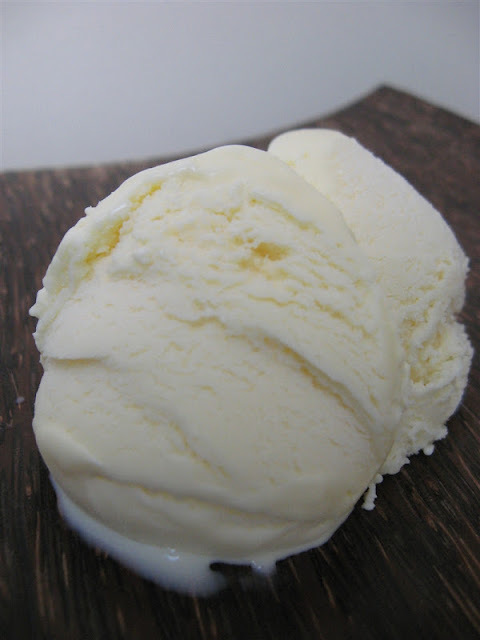 It is also used as a substitute for vanilla. Ancient Egyptian writings advised adding mastic to bad-tasting water and incense, the Koran encouraged Muslims to add mastic to their bread and ancient Jewish halachic sources even permitted chewing mastic on Shabbat to combat bad breath. 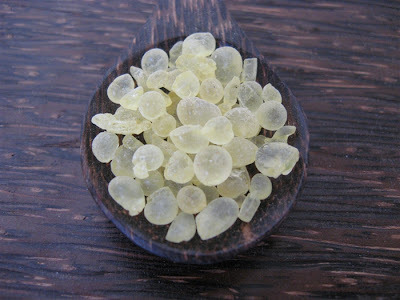 Mastic was the first chewing gum ever known, as the sun-dried resin granules soften when chewed. In fact the word mastic originates from the Greek verb “to chew”, as does the similar English word “masticate”. In ancient times, mastic was used medicinally for intestinal disorders, dental and mouth diseases, diabetes and bronchitis. In the Middle Ages, it was used for cholesterol, blood pressure, burns, eczema, frost-bite and cholera. Today it’s believed to be a treatment for ulcers and have antimicrobial effects, which is why it’s used in toothpaste, mouthwash, and dental fillings. Interesting it’s used to manufacture self-absorbing surgical threads and sticking septic bandages on surgical wounds. Anyway, this is my entry to Think Spice, Think Mastic. Please visit Kopiaste to read Ivy's round-up. Eggplant is my secret love. I sneak it in whenever I can. Jonas, the vegetarian, despises eggplant. He abhors the texture and protests at the taste. Imagine being a vegetarian and not liking eggplant? It's a disability. Truly. Usually, when Jonas isn't home, I take the opportunity to cook fish or meat but one night I seized the chance to use eggplant. And the best eggplant dish of all has got to be eggplant parmigiana. 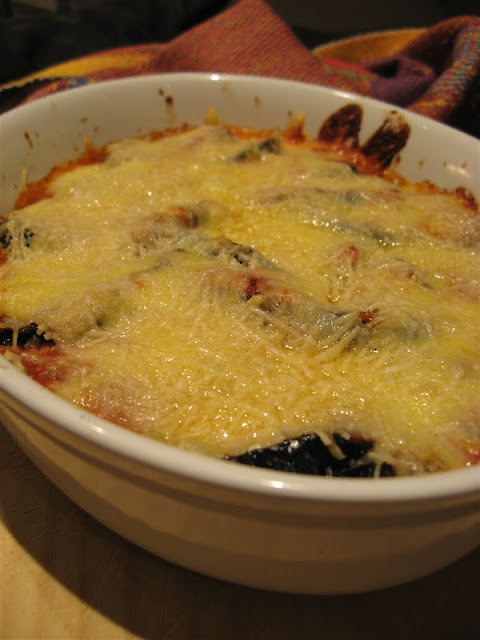 Nonna would make the most delectable melazane all parmigiana and we'd all fight over it. Except for Ludo, whose gluten intolerance meant Nonna used rice flour and made Ludo her own sacred batch. Inspired by memories of Nonna's melanzane, I decided to make my own eggplant and cheese bake. The results were magnificent and I ate 3 servings! Jonas found some leftovers when he came home and ate them, declaring it was so good he could forget that it was eggplant. Anna’s very own recipe. Serves 2 as a side dish or 1 as an indulgent dinner. 2. 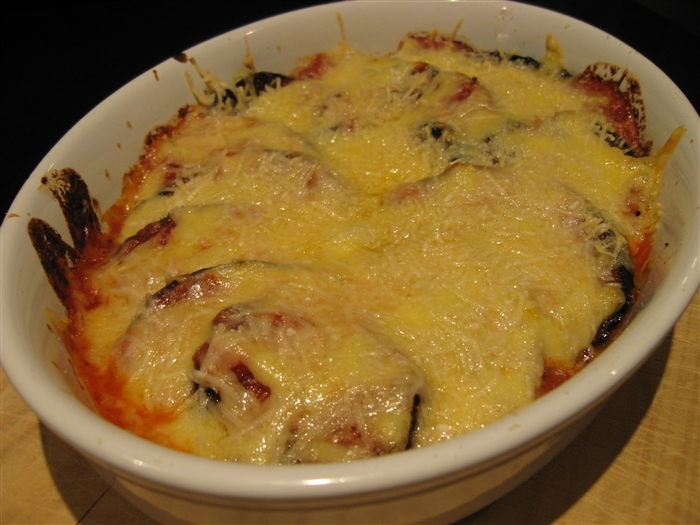 Slice eggplant into 1.5cm rounds. Dust with salt and sandwich between two paper towels and cutting boards weighed down with cans. This will draw out some of the extra moisture in the eggplant. 3. Meanwhile make the sauce. In a pan with a lid, heat the olive oil and fry the garlic and chilli until softened. 4. Add the white wine and bring to the boil. Evaporate the alcohol for 2 minutes then return to a low heat. 5. Add the oregano, passata, salt, pepper and sugar then simmer gently with the lid on. 6. Start heating oil to shallow fry eggplant. 7. Remove the eggplant, wash off the salt and pat dry with paper towels. 8. Dust eggplant slices with seasoned flour, then dip in egg and coat with breadcrumbs. Drop into the oil and cook until golden brown on both sides (3-4 minutes). Don’t over crowd the frying pan and be sure to drain finished slices on paper towels. 9. In a baking dish, coat the base with a little tomato sauce. 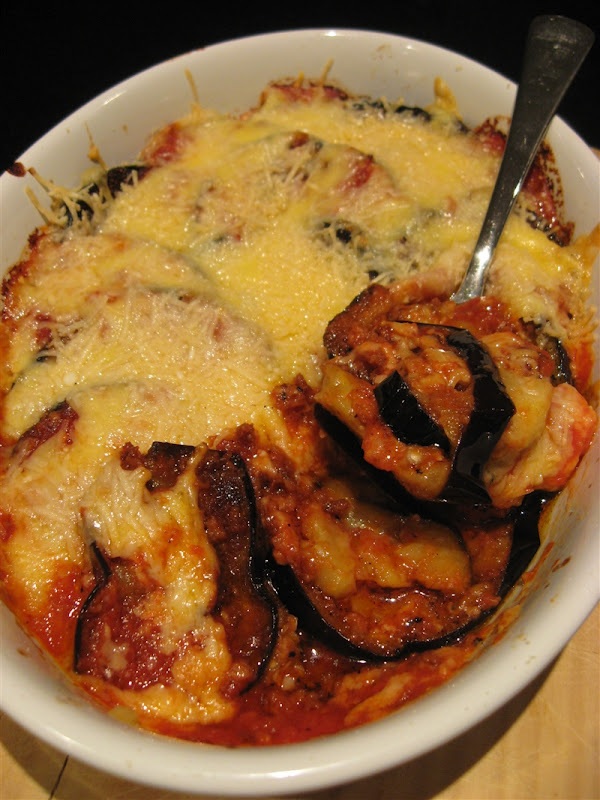 Layer eggplant in a single layer, slightly overlapping each other. 10. Cover with mozzarella and then parmigiano and bake in the oven for 15-20 minutes or until cheese has melted and is starting to brown on the edges. Serve with crusty bread and a good glass of wine. 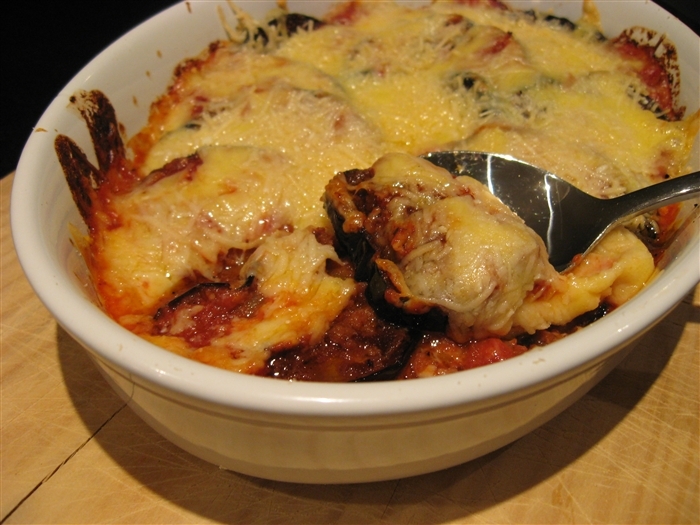 Eggplant are part of the Solanaceae, or nightshade, family that includes tomatoes, bell peppers and potatoes. They grow hanging from vines and have a bitter taste and spongy texture. Originally they were used as a decorative plant because the bitterness of the original cultivars made people believe that eating them would cause insanity, leprosy and cancer. Once cultivars lost their bitter taste, in the 18th century, they soon became very popular. Eggplants are native to India but it’s believed they were first cultivated in China (5th century B.C.E.) where the first written record was recorded in an ancient agricultural treatise. Given the numerous Arabic names for eggplant, but the few Greek and Latin names, it is believed that eggplant was introduced to Europe, during the Middle Ages, through North Africa then the Mediterranean. Even in the English speaking world the name of this vegetable is debated. In the UK it’s known as aubergine, in the US, Canada, Australia and New Zealand we call it eggplant and in South Africa they call it by its Indian name brinjal. Eggplants contain phytonutrients, many of which have antioxidant activity. For instance nasunin, which is found in eggplant skin, is believed to be a potent antioxidant and free radical scavenger that protects cell membranes. Chlorogenic acid, also found in eggplant, has anti-cancer, antimicrobial, anti-cholesterol and antiviral properties. Wikipedia says wggplants are a high source of “dietary fibre, potassium, manganese, copper and thiamin (vitamin B1). It is also a good source of vitamin B6, folate, magnesium and niacin.” Yep, I believe it. On the negative side, eggplant is among the few foods that contain measurable amounts of oxalates, meaning people with kidney or gallbladder problems should avoid eating eggplants, which may cause stones. Eggplant also contains more nicotine than any other edible plant, however you’d need to eat 9kgs (20lbs) to get the same levels as one cigarette. Eggplants come in a variety of colours, shapes and sizes. When purchasing, choose onbe that is firm and heavy for the size, has smooth and shiny skin with vivid colouring. According to Wikipedia, today the top producers are, in order: China, India, Egypt, Turkey, Indonesia, Iraq, Japan, Italy, Sudan and the United Kingdom. This is my contribution to Weekend Herb Blogging, hosted by Susan from the Well Seasoned Cook. Fried Eggplant w Walnut & Mint Sauce - What Did You Eat? Inspired by the current economic crisis, the theme for Mixology Monday this month is Hard Drinks for Hard Times, hosted by Matthew of Rowley's Whiskey Forge. Not only will the round-up provide many ideas for debauchery on the cheap, but the writing is tres witty. For my own entry, I chose this Peach & Ginger Punch because it makes me think of old ladies on a porch during the Depression (the first one), drinking the juice from the peaches in their gardens. 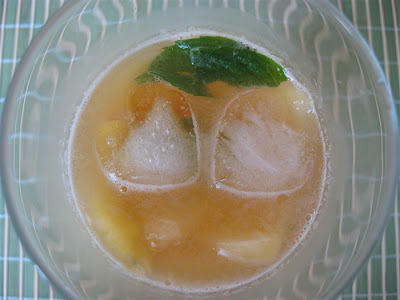 Most of the mixers are cheap and easy to come by, rum is hardly the most expensive of spirits and since it’s summer in Australia peaches are a plenty. And because you can serve a lot of people with hardly any alcohol, it’s very economical. All contributing to the theme. But best of all, it’s very tasty and is one of those drinks that makes you smile as you lean back and watch the world go by. Recipe by Michele Cranston. Serves 8. 1. 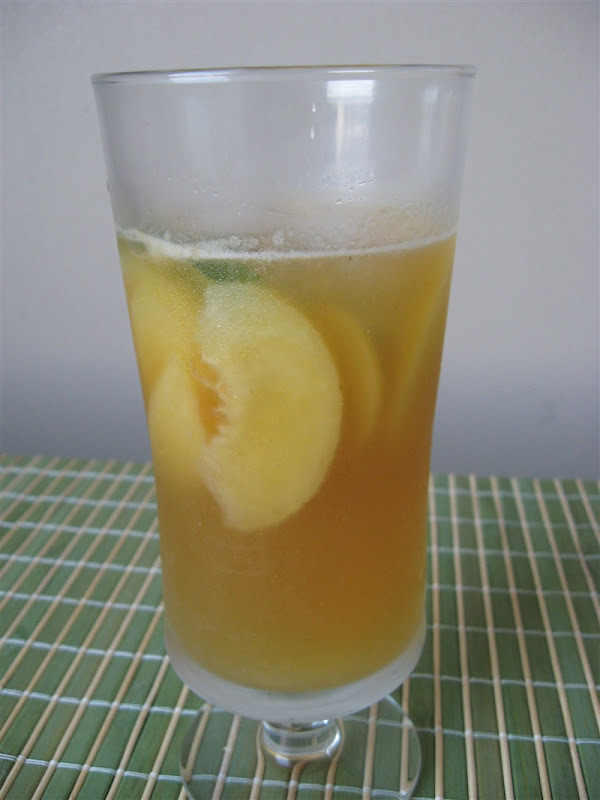 Chill the ginger beer and peach nectar. 2. Combine the ginger syrup, rum and lime juice in a non-reactive container. Add peaches and chill for 2 hours. 3. When everything is cold, combine ingredients in a punch bowl and serve with garnish. It might not look very nice, but this noodle dish is quite delicious. It’s not quite as delicious as the version I tasted in Ubud (Bali, Indonesia) at the Casa Luna restaurant, but then getting my hands on the tiny kaffir limes and other native ingredients isn’t as easy in Sydney. It’s as close as I’m going to get. This is my contribution to the 100th episode of Presto Pasta Nights, hosted by the founder Ruth from Once Upon A Feast. If you’re interested in more Balinese posts (photos and all! 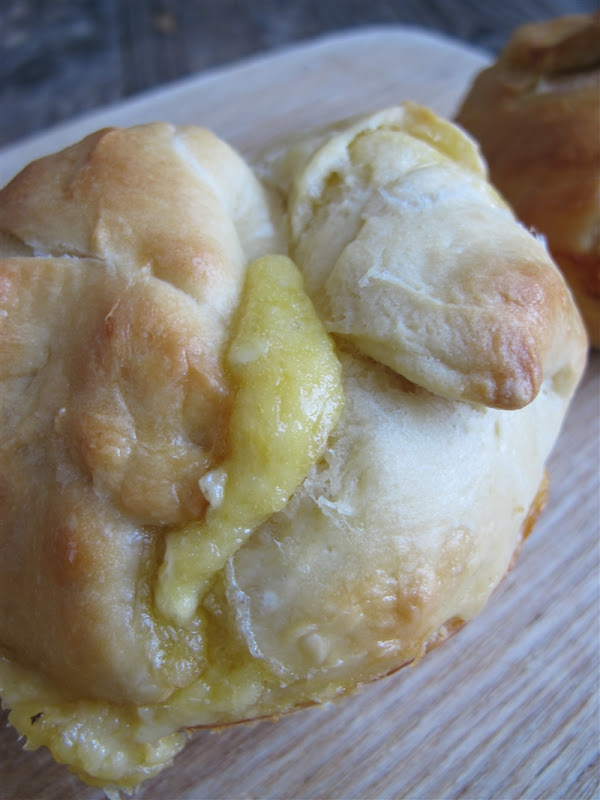 ), I’ll add the links below the recipe. Anna’s version of a meal eaten at Casa Luna. Serves 2. 1. Remove the tough outer leaves of the lemongrass stalks until you come to the tender, pale leaves underneath. 2. Mince the stalks very, very finely although stop when you reach the higher, woodier part of the stalk. You only want the soft, moist end near the bulb. 3. In a pan, heat the coconut milk with a little salt and long pepper as well as the lemongrass and kaffir. Bring almost to the boil the reduce heat and simmer for 10 minutes. Remove from heat. 4. In the meantime, soak the vermicelli in a bowl of freshly boiled water until soft (about 5 minutes). 5. In the meantime, season the scallops with salt and long pepper, then pan fry for max 60 seconds on each side. 6. Drain the vermicelli and divide between two bowls. Divide the lime juice and sprinkle over the noodles. 7. 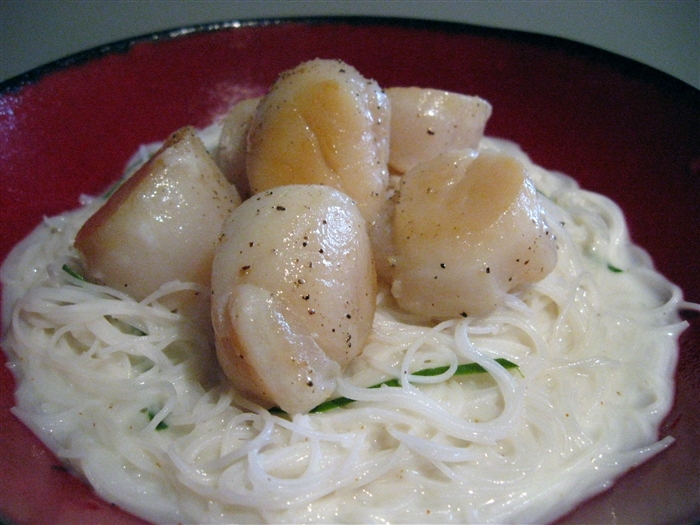 Divide the coconut sauce into the bowls until there’s just enough to dress the vermicelli. Toss well. 8. 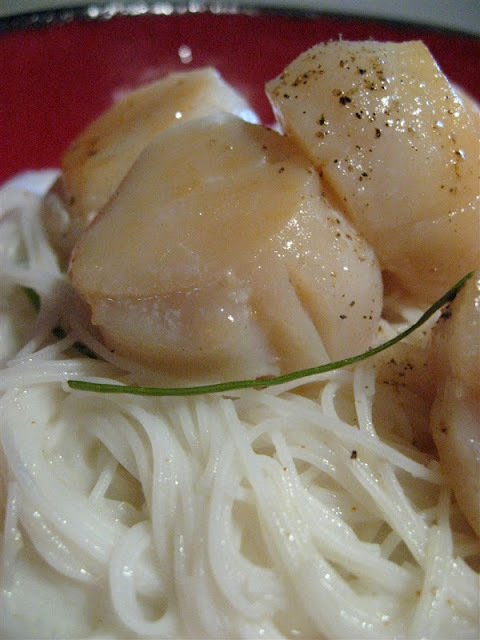 Garnish noodles with chilli and mint then top with scallops. Can be served warm or room temperature. This is the first Creole/Cajun recipe I've made for my 2009 Food Challenges. The flavours worked well and made chicken breasts, something I'm not a huge fan of, taste very good. 1. Combine spice mix with lime juice and liquid smoke. 2. 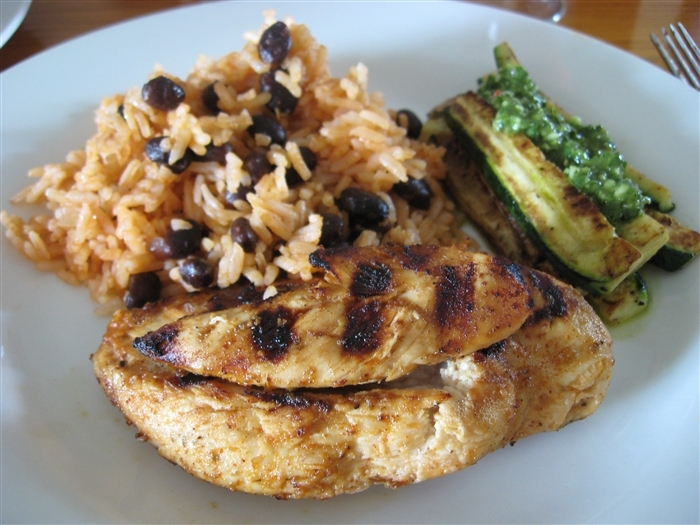 Marinate chicken breasts overnight. 3. Barbeque chicken over charcoal for 10 minutes. I served my spiced chicken with grilled zucchini & chimichurri sauce and arroz congrí (tomato and black bean rice). Elote is a typical Mexican dish, served by street vendors around the country. 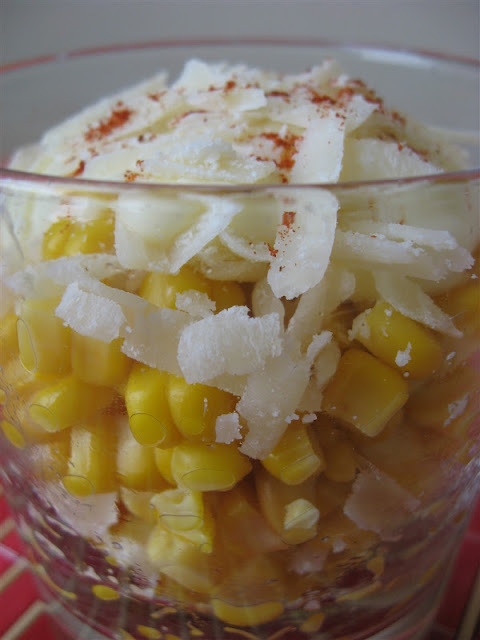 It consists of grilled corn served with accompaniments like lime, salt, chilli, mayonnaise, sour cream, cheese and even shredded chicken. I prefer esquite, which is identical to elote only the corn kernels are sliced from the cob into a glass and the accompaniments piled on top so you can eat it more easily with a spoon. Now I have never been to Mexico, so my experiences of elote and esquite come purely from my dinners at the home of Mexican amigos Vicky & Roberto. We're hoping to make it to Mexico in January 2010, as part of a huge around-the-world journey, but since it's a very ambitious holiday plan it might not happen. Fingers crossed. In anticipation, I made Mexican food a focus cuisine for my 2009 Food Challenges and have made quite a few things already. This being another one! We usually eat our elote and esquite sprinkled with tajin, but since this Mexican seasoning of powdered chilli, salt and dehydrated lime juice isn’t readily available all over the world I’ve provided an alternative recipe. Vicky & Roberto's recipe. Serves 2. 2. Brush the corn with the olive oil then grill until cooked through. 3. Slice the kernels from the cobs, into a bowl, and squeeze out corn milk from the cob. 4. 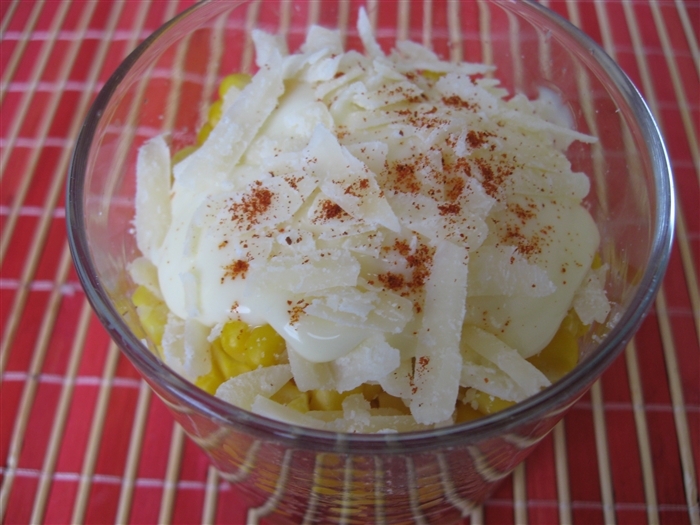 Toss the corn with salt and cayenne then divide between bowls. 5. 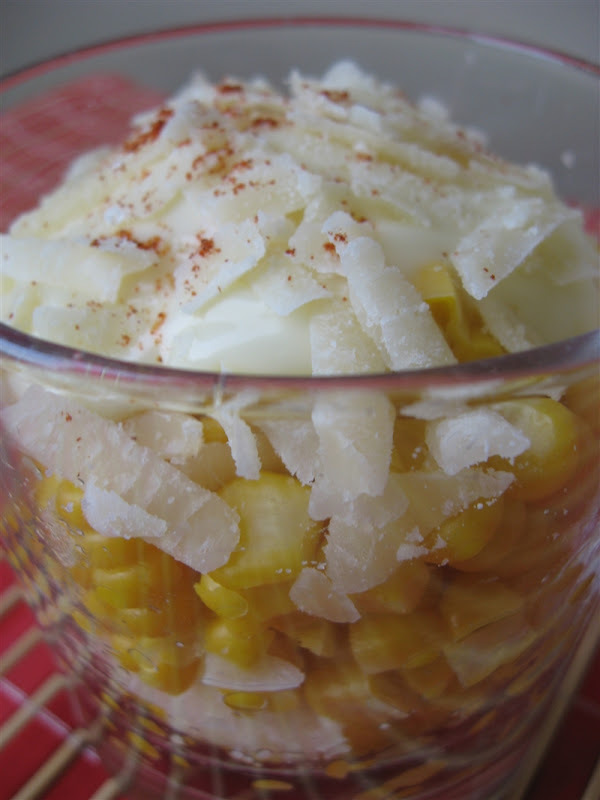 Allow people to top their corn with mayonnaise and cheese to their taste, then provide lime quarters for squeezing. Variation: ¼ teaspoon tajin instead of cayenne pepper. Corn, also known as maize, is one of the many wonderful and delicious food sources to come from the Americas. Corn originated in Mesoamerica then spread across the American continent. Once the Europeans began to colonise the Americas, corn spread all over the world. The word maize comes from the indigenous Taino through Spanish while the word corn used to be applied to any kind of cereal. It’s believed that corn was first domesticated in Mexico more than 9,000 years ago. By 1500BCE it started to spread all over the Americas and became the staple food for pre-Columbian North American, Mesoamerican, South American, and Caribbean cultures. When corn cultivation spread to the US Southwest (1st millennium CE) and US Northeast and south-eastern Canada (2nd millennium CE) it created new landscapes as Native Americans cleared forest and grassland for their crops. Corn is the most widely grown crop in the Americas and the US produced 332 million tonnes annually on its own. It’s therefore not surprising that five of the world’s top ten corn producers are located in the Americas. The top producers are, in order, the US, China, Brazil, Mexico, Argentina, India, France, Indonesia, Canada and Italy. Corn contains and an indigestible protein which can cause an allergic reaction leading to rashes, swelling, itching, diarrhoea, vomiting, asthma and even anaphylactic shock. What’s even stranger is that people with corn allergies almost always have peach allergies too. 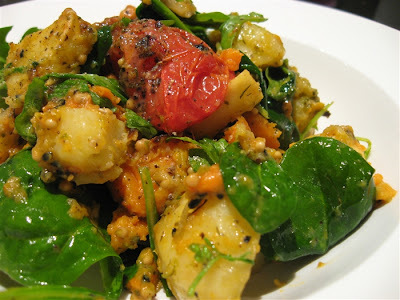 Check out the Weekend Herb Blogging round-up over at Cheryl's Gluten Free Goodness. Until I was 7 I grew up with a mother, a father and two brothers. Then my parents divorced and I suddenly had two extra sisters, a step father and an extra mum and two wonderful extra grandparents. Not to mention my stepsisters' mother and her new husband and his kids. And my mother's two close female friends their children. Whoa! You get the picture. It's a mega tribe that was not without its fights and frictions but now that we're all adults the bad egg was weeded out and the true, loving family members remain. I'm reflective of all of this because one of my closest friends just had a baby. She had planned, so hopefully, to have a home birth but her son showed his first streak of parental rebellion. He refused to come out and too late grew too big for my friend’s tiny frame and she ended up having to have a caesarean. I felt bad for her because she's wanted that home birth so much, but then I also felt so happy for her that she was able to make all the right choices throughout her 9 months that led to a beautiful, healthy boy - at 9.1 pounds no less (4.1kg)!!! She is only my second friend to have a child so it's all very new (and frightening!) to me. It makes me think about my own family and when Jonas and I will decide to have kids. To be honest, I'd rather someone just hand me a 2yr old and say "it's yours!" because babies and pregnancy do not interest me in the slightest. But I highly doubt some tired mother would hand over her toddler in the supermarket and let me keep it, so it looks like I'll just have to grow my own. I am so jealous of men’s roles in the baby-making process. As a woman I feel utterly ripped off. Somehow, this little whinge leads into the February Monthly Mingle theme of "healthy family dinners". The host is Michelle from What’s Cooking Blog. Although most people think “kids” when they think “family” not everyone has kids and so my contribution to this healthy family dinner theme is a recipe for my own little family of two: Jonas and me. Since he is a vegetarian, my recipe contains no meat. And since it’s winter in the northern hemisphere, where most of my blogging pals and readers reside, I decided to go with a recipe we cooked last winter. Jonas’ very own recipe. Makes ½ cup. 2. In a baking tray, toss root vegetables with olive oil and crushed garlic. 3. Bake for 20 minutes. Then add another baking tray holding cherry tomatoes tossed with sumac and olive oil. 4. Bake for another 20 minutes until tomatoes are soft and starting to wrinkle and burst. 5. Check the root vegetables and remove when they are tender. 6. Drain the excess olive oil from the tomatoes and vegetables to use in sauce. 7. Toss the warm vegetables with the baby spinach and herb and mustard sauce (recipe below). Serve warm. Note: cheese in this salad would taste very good too. 1. 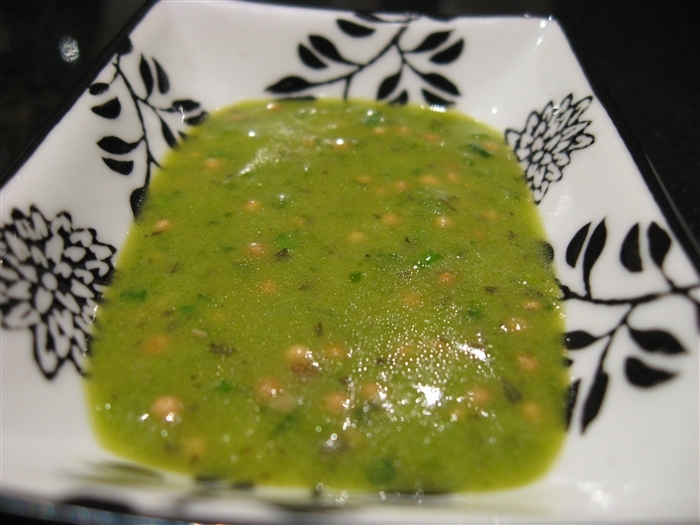 In a food processor or blender, combine the herbs, mustard and vinegar until pureed. Add salt and pepper. 2. With the motor running, slowly add the olive oil until it emulsifies with the sauce. Taste to ensure acidity is balanced and adjust as needed. Note: Use as much of the olive you can salvage from the roasted tomatoes and vegetables but ensure at least 5 tablespoons are added to the sauce. Well another month has rolled around and so it's time again for First Thursdays. 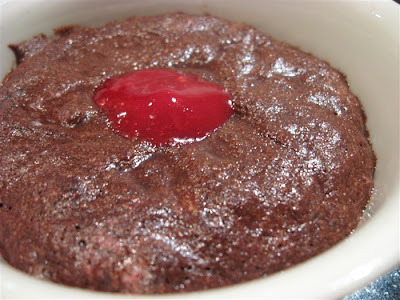 This time the theme is romantic clichés and, although it's one of my all-time favourite desserts, there's nothing more clichéd than a chocolate fondant on Valentine's Day. It seems to be that quinessential Valentine's dessert that could appear on the set menu of any restaurant around the world. My version is plucked up with a few raspberries, however you could simply omit them if berries aren't your thing. Now a little warning friends, make sure you grease your moulds very well or you'll end up with fondants like mine that had to be eaten from their baking dish. It tastes the same, but you don't enjoy the effect of breaking into the cake and watching the molten chocolate interior ooze out. Delish! 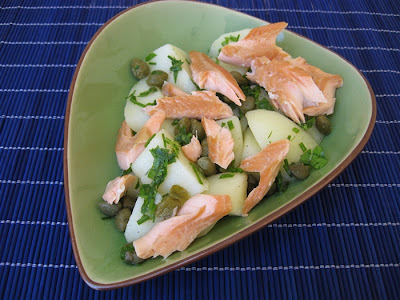 Oh, and this might just be another French dish for my 2009 Food Challenges! Très magnifique! Anna’s adaptation of recipe from Australian Gourmet Traveller Nov 05. Serves 4. 2. 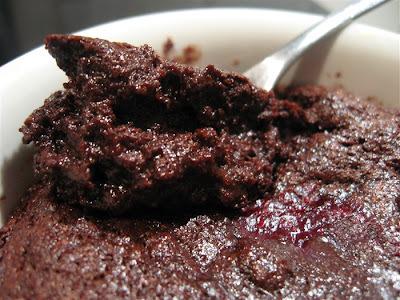 Combine chocolate, raspberries, butter, cocoa and a pinch of salt in a large bowl. 3. In a separate bowl, whisk egg whites until soft peaks form. 4. Scatter in sugar and whisk until stiff and glossy. 5. Fold egg whites into chocolate mixture then divide between four well-greased 1-cup dariole moulds. 6. Bake in oven for 6-8 minutes then unmould onto serving plate and serve immediately. I love warm potatoes tossed in tangy dressing. There’s nothing more delicious in my opinion. 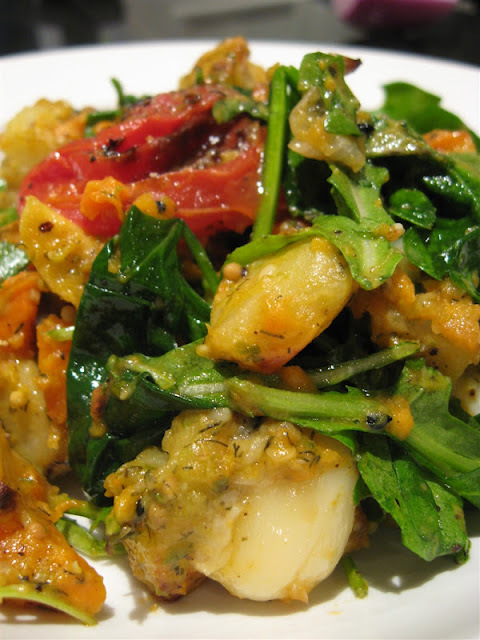 The earthy starchiness of the potato is balanced wonderfully by fresh herbs and acidic lemon. In this salad, gorgeous smoked trout flesh is a rich addition and lifts the recipe from a side dish to a light meal on its own. Capers help to cut through the richness of the fish with their own salty, briny bite. 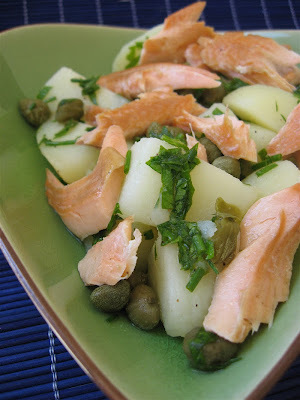 I simply love this salad, and using my father’s home-smoked trout makes it even more superb. Anna’s very own recipe. Serves 2 as light starter. 1. Peel potatoes and chop into chunks. 2. Boil potatoes until tender but not disintegrating (5-10 minutes). 3. While the potatoes are boiling, make the dressing by combining the olive oil, lemon juice and chopped herbs. 4. When potatoes are cooked, drain and place in a bowl. Top with dressing and toss to combine. Allow to cool 5 minutes and mingle flavours. 5. Next add capers, salt and pepper and toss again. 6. Serve topped with flaked smoked trout. Capparis spinosa is native to the Mediterranean and is a spiny shrub whose immature bud is pickled and sold as the delectable caper. The mature fruits are also pickled and sold as caperberries. 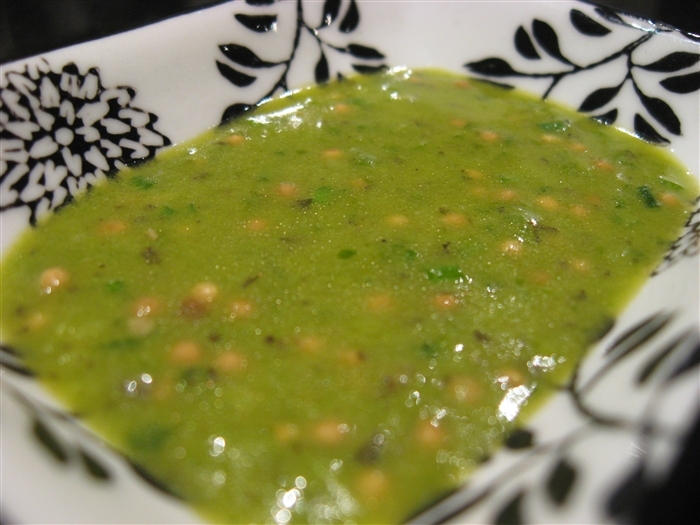 Capers grow wild in the Middle East and North Africa and there is evidence the Egyptians consumed them as far back as 18,000 years ago. When the buds are ready for harvesting they turn dark olive green. They are hand-picked then pickled in either salt or brine. 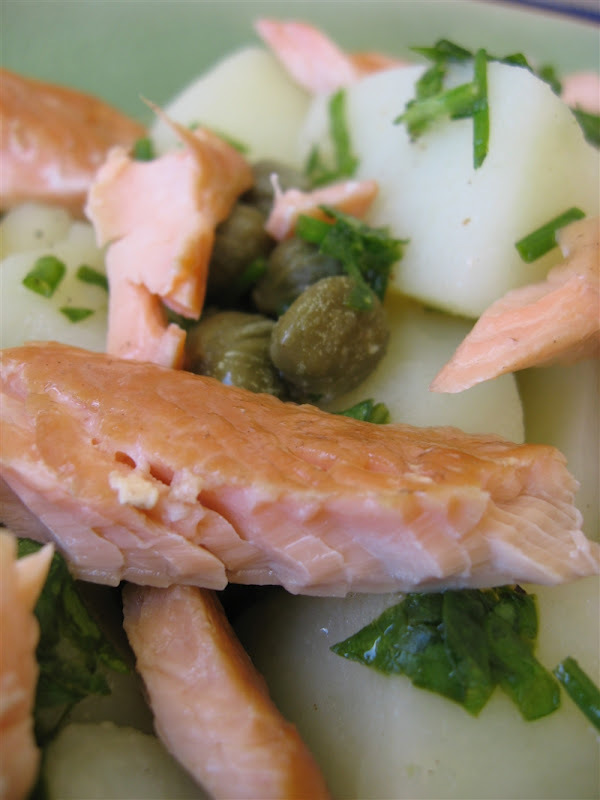 Capers are sold by their size, the smallest considered the best: non-pareil (up to 7mm), surfines (7-8mm), capucines (8-9mm), capotes (9-11mm), fines (11-13mm), and grusas (14+mm). The tiny white blemishes sometimes visible on capers is the crystallisation of rutin, an enzymatic reaction from the mustard oil (glucocapparin) released by the buds. 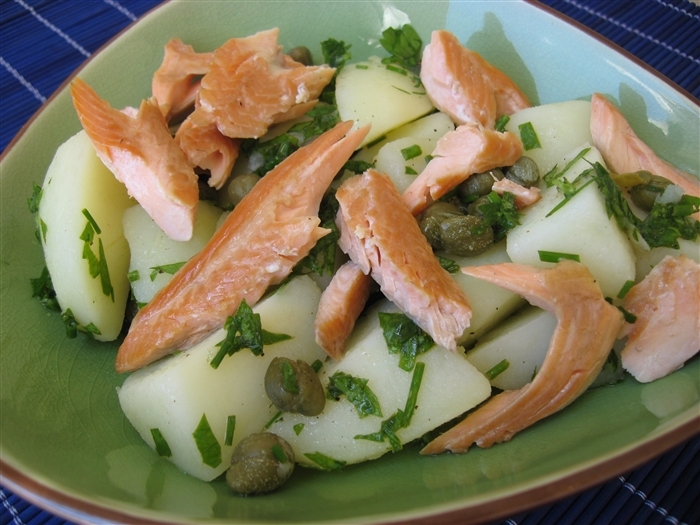 In Greece, the caper leaves are also pickled and used in salads or fish dishes. Dried caper leaves can also replace rennet in the cheese-making process. Our Weekend Herb Blogging host this week is Dee from The Daily Tiffin so check out the round-up in about a week. We had a Georgian friend once upon a time. His name was Mamuka and we met him when he was studying English in Australia. He lived in Moscow but he was fiercely proud of Georgia and we all loved to watch him write in the beautiful Georgian alphabet. I wonder what happened to Mamuka? We lost touch about a year after he moved back to Russia, although not before he sent photos of his summer home in a picturesque Georgian valley. I have always wanted to visit Georgia. It seems fitting then that Jonas made a Georgian bread for this month’s Bread Baking Day with the theme “cheese breads”. Our host is Temperance from High on the Hog. Khachapuri are the cheesiest breads there are. In fact you could easily label them Georgia’s answer to the pizza. They commonly use a traditional Georgian ingredient called sulguni (სულუგუნი), a pickled, salty cows’ cheese from the Samegrelo region. 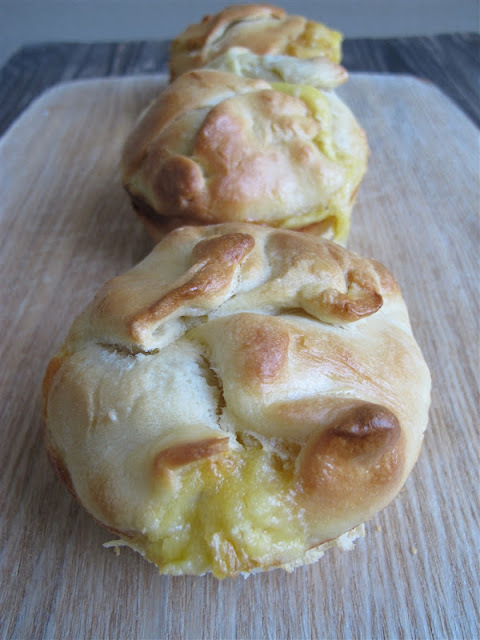 There are as many different styles of khachapuri as there are regions in Georgia and some of the better known as Adjaruli khachapuri (topped with a raw egg), Megruli khachapuri (topped with more cheese) and Ossuri khachapuri (filled with mash potatoes). Jonas made the standard khachapuri, although we don’t have access to the rare sulguni and had to make do with another cheesey combination. It was delicious nonetheless. This is also a 2008 Food Challenge, which has rolled over into the 2009 batch since it didn't get made last year. 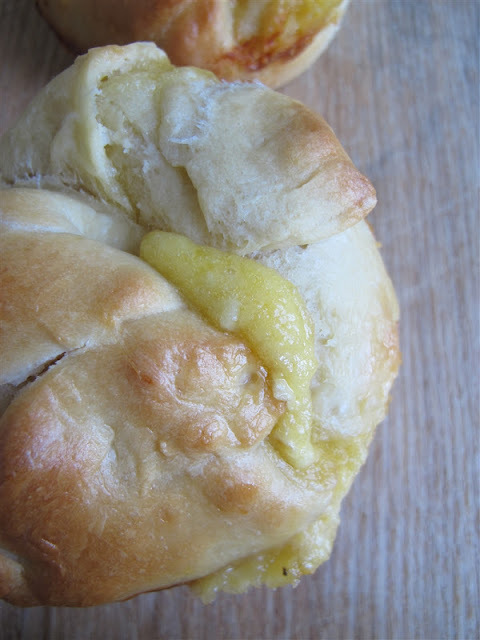 Recipe from The World Encyclopedia of Bread. Serves 6. 2. Cream the yeast with the milk, add to the flour and mix to form a dough. 3. Knead in the butter, then knead on a lightly floured surface until smooth and elastic. 4. Place in a lightly oiled bowl, cover lighting with oiled clear plastic film and leave to rise in a warm place for 1 – 1½ hours or until doubled in size. 5. 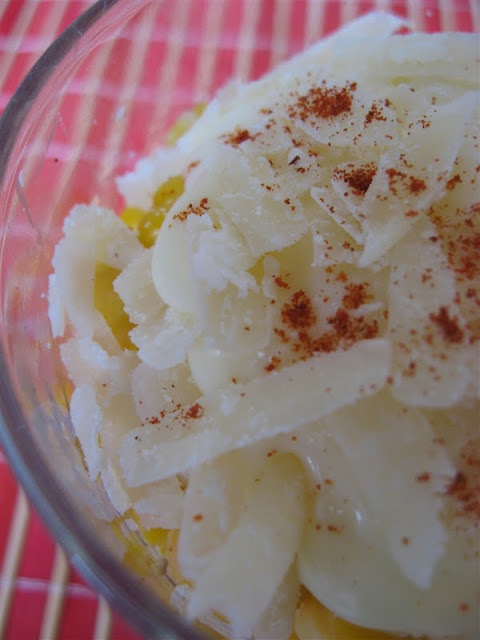 Meanwhile put the cheeses in a bowl and stir in the egg and softened butter for the filling. Season with plenty of salt and pepper. 6. Turn dough out onto a lightly floured surface and knead for 2-3 minutes. 7. Divide the dough into four even balls. Roll each ball out into a rough circle. 8. Grease a muffin tin or ramekins, and place each circle into the holes. Drop in the cheese mixture into the centre then fold over the dough to seal the cheese inside. 9. Cover with oiled film to rise again for another 20 minutes. 10. Preheat oven to 180’C. 11. Mix egg yolk and water together to form a glaze then brush bread with glaze. 12. Bake for 50 minutes, or until brown on surface. 13. Cool for 5 minutes then remove from tin/ramekins and serve warm cut. Variations: instead of Cheddar & Taleggio you can use many other cheese combinations such as Munster & Havarti or Red Leicester & Parmesan.